• Victimization – BP committed its first offense in May when Hayward expressed the wear and tear of the constant media spotlight by saying, “I’d like my life back.” He failed to express caring, contrite and responsible leadership. 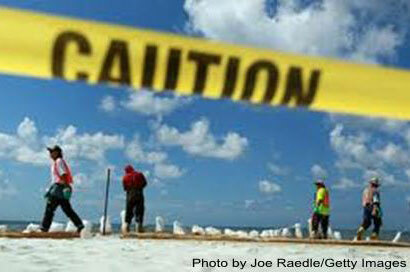 • Minimizing a disaster – On May 14, 2010, Hayward declared, “The Gulf of Mexico is a very big ocean. The…volume of oil and dispersant we are putting into it is tiny in relation to the total water volume.” As PR Strategist pointed out, “That’s like saying the amount of poison the murderess put into her husband’s tea was quite small.” Don’t minimize a disaster. • Avoid predictions – On May 18, 2010, Hayward asserted, “I think the environmental impact of this disaster is likely to have been very, very modest.” When paired with images of oil-soaked birds, soiled beaches and out-of-work fishermen, it appeared cold and clueless. • Know the facts – On May 30, 2010, Hayward said, “The oil is on the surface. There aren’t any plumes.” Images then surfaced showing otherwise. BP failed to care enough to learn the facts. • Carefully choose words – BP Chairman Carl-Henric Svanberg uttered that BP really cared about “the small people.” It was taken by many as a demeaning statement from a global enterprise completely out of touch. While worldwide businesses are usually sophisticated enough to have a crisis communications plan, BP appeared unprepared. As you plan your business strategy for the coming year, dust off that crisis communications plan, read it and update it. If you don’t have one, we can help. Here are some tips to get you started. RSS ― short for Really Simple Syndication, RSS is a feature that a developer builds into a website. The RSS reader allows users to subscribe to your site for free content updates, including blog posts, news headlines and videos. Content is delivered directly to RSS “subscribers” via a “feed” they log into and check. One free RSS reader is Google Reader. Wiki ― a collection of Web pages designed to enable anyone with access to contribute or modify content. One of the best tools for business-to-business (B2B) networking is LinkedIn. If you are not using it to learn more about prospects for business, you could be missing valuable market intelligence. Since its rollout in 2003, LinkedIn has morphed from an interactive rolodex of sorts to a growing discussion forum where industry professionals converge to share knowledge and resources. LinkedIn provides instant access to your professional network and to the professional networks of your connections. It now has more than 85 million members in 200-plus countries. Business leaders use LinkedIn to find clients and business partners, gain industry expertise, post job opportunities and discover inside connections that help with business opportunities. With the introduction of a Groups feature in June 2010, LinkedIn facilitates discussions among industry sectors about relevant issues affecting business. More than 650,000 groups were formed in the first month of the new feature. The Greater St. Louis area boasts more than 50,000 contacts in a variety of industries, including information technology, higher education, hospital and healthcare, marketing, financial services and law practices. While there is a great chance you’ll find an existing client or business partner already using LinkedIn, the Groups feature makes it easy to develop mutually beneficial relationships with additional industry professionals. If there isn’t a niche group already started in your area of expertise, be a social media pioneer and give it a shot! Start a discussion group, make contacts, meet to network and share insights. 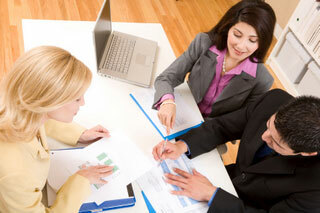 Casey Communications offers one-on-one and group training. To discuss your training needs, contact our e-team leader, Christy Redmond. Social media policies help protect businesses and manage online message content by outlining guidelines, expectations and consequences for online users. Tell us about your company’s social media use and policy. Social media has engulfed the world of mass communication. Facebook currently has more than 500 million users globally and Twitter’s international population has catapulted to more than 175 million. But with so much online interaction, how can organizations comprehensively manage risks associated with their brands? A written social media policy helps a company manage its brand online by outlining clear guidelines, expectations and consequences for employees, volunteers and site visitors who create or contribute any online content on behalf of a business or nonprofit institution. By addressing these considerations, you will be in a better position to manage risks. Does your company have a social media policy or need help preparing one? Tell us about your company’s online usage and social media policy. Our survey results will be published in the next “From the Writers’ Desk” e-newsletter!